Lean Max ™ Super Meal is the ultimate fuel for your lean body which includes 17 highly effective systems creating a powerful lean physique. Ingredients: Cocoa powder (processed with alkali), sunflower lecithin, tricalcium phosphate, carrageenan, xanthan gum, natural and/or artificial flavors. Ingredients: Tricalcium phosphate, xanthan gum, natural and/or artificial flavors. Ingredients: Tricalcium phosphate, xanthan gum, natural and/or artificial flavors, beet root powder (natural color), blue cabbage powder (natural color). SUGGESTED USE:Mix 2-4 scoops of powder with 16 -32 oz (473ml) of water or your favorite beverage. blend and enjoy! 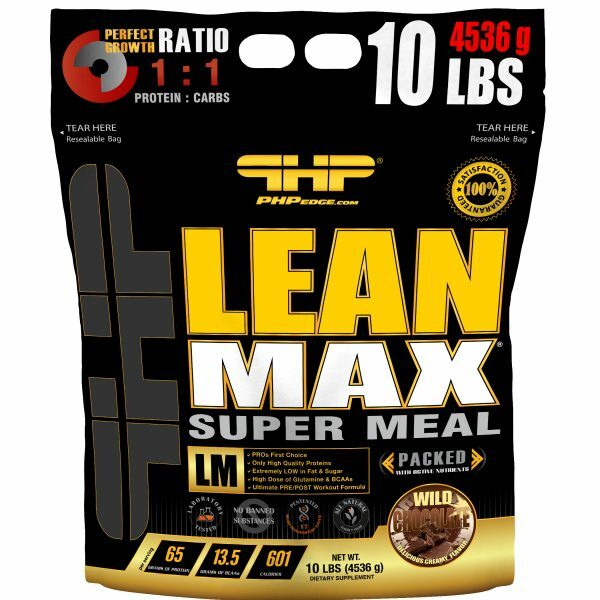 For optimum mass gain results, it is recommended to consume LEAN MAX® SUPER MEAL twice daily for eight-week period. Can be used before workouts, after workouts, Individual nutritional requirements vary depending on gender, body weight, level of activity and exercise/training intensity. CAUTION: Do not use if you have previously experienced a heart attack. Do not use if you have had any heart problems or have established coronary artery disease. Consult a health care practitioner prior to use if you have human herpes virus or sickle cell anemia. If you suffer from hypotension or diabetes or if you are taking hypertension medication, cyclosporine, estrogens, birth control medications, medroxyprogesterone, norethindrone, nitrates, potassium increasing drugs, sildenafil, xylitol, and/or aminophyllins. Discontinue use if you have gout. Discontinue use if you have decreased platelet count. Discontinue use if you have elevated levels of blood urea-nitrogen and or serum creatinine. Discontinue if you have delayed menses. Do not use if you have asthma. Do not use if you are under 18, pregnant or breastfeeding. Discontinue use if you experience nausea, headache, fatigue or indigestion. Consult a health care practitioner prior to use if you have a kidney disorder. Accidental overdose of iron-containing products is a leading cause of fatal poisoning in children under 6. In case of accidental overdose, call a doctor or poison control center immediately. May result in weight gain. Not to be used as the only source of nutrition. This product is packed by weight and not by volume. Store in a cool dry place. Do not use if seal is broken. Keep out of reach of children.